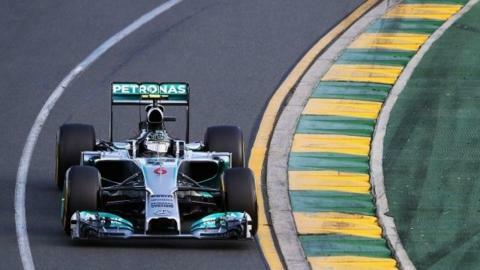 Nico Rosberg delivered on Mercedes' promise with a dominant victory in the season-opening Australian Grand Prix, as Lewis Hamilton retired on lap three. Red Bull's Daniel Ricciardo was second, but was later disqualified for a fuel-flow rate infringement. The decision promoted Dane Kevin Magnussen, who made a stellar debut for McLaren, to second. He beat team-mate Jenson Button into third, with Ferrari's Fernando Alonso fourth from Williams' Valtteri Bottas. Polesitter Hamilton had a cylinder failing to fire from the very start of the race, and was down to fourth behind Rosberg and Ricciardo by the first corner. The 2008 world champion dropped to fifth by the end of the first lap and was called into the pits shortly afterwards. World champion Sebastian Vettel also hit early power-unit trouble in his Red Bull, retiring a lap later than Hamilton with an engine failure. Eight cars failed to finish as F1 started a new era with high-tech turbo hybrid engines and a limit of no more than 100kg of fuel for a race distance. Hamilton's retirement left Rosberg unopposed out front and the German drove a controlled race in what is clearly a dominant car to lead until the end. "It's been an amazing day," said Rosberg. "I'm over the moon really, everyone has worked so hard over the winter and to have such an amazing Silver Arrow. I'm really thankful to Mercedes for giving me such an amazing car. "There is a lot of work to do. We can still improve a lot and we must because the competitors are not going to be asleep." Behind him, Ricciardo was able to complete a race distance in a Red Bull for the first time since the car appeared at the end of January. The team had previously not managed to do more than about 20 laps in a row in pre-season testing. Speaking before his disqualification, Ricciardo said: "Two or three weeks ago I would have bet pretty much everything I had that we would not be standing up there." The Australian was in a comfortable second place for most of the race but came under pressure from Magnussen in the final 20 laps. Magnussen was within a second of the Red Bull with five laps to go but Ricciardo was able to hold on to the end. Ricciardo was eventually disqualified around six hours after the end of the race. Behind them, Button was unable to close on Magnussen, but beat Alonso by jumping ahead of the Ferrari at their final pit stops. "It's hard to believe," said Magnussen. "It seems so surreal. The car was so much better than it has been at any point. I just had exactly what I needed the whole race. The preparation we have done this winter has been fantastic." Williams' Valtteri Bottas was fifth after an incident-packed race in which he hit the wall on the exit of Turn 10 and broke a wheel, triggering a safety car period. The Finn dropped back to 16th place but used the pace of the Williams to fight back up the field. Force India's Nico Hulkenberg ran fourth in the early stages after jumping up from seventh on the grid and passing Alonso on the first lap. But the German slipped back to finish sixth ahead of the second Ferrari of Kimi Raikkonen. The Toro Rossos of Jean-Eric Vergne and rookie Daniil Kvyat took eight and ninth places. The Russian replaces Vettel as the youngest points scorer in F1 history.